Imagine a magical wonderland where all little girls can have their wishes come true! 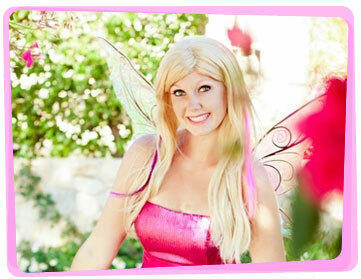 Whether you want to hire a fairy for a kids party or another event, Yabadoo has the most enchanting fairies for hire in Adelaide. Your Adelaide based entertainer will enchant the children with a delightful magic show, balloon sculpting, awesome fairy party games (like pass the parcel), face painting, music, dancing and other great fairy party ideas. Our kids party fairy for hire will also design a giant pair of balloon wings and a balloon wand for the birthday girl during the magic show (so they know they’re extra special). Our entertainers wear bright and beautiful professional costumes and have backgrounds in magic and drama. 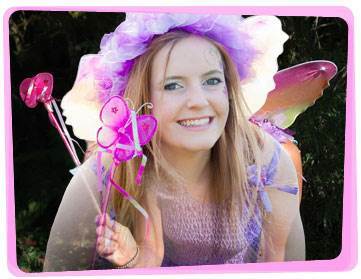 Our party fairies in Adelaide perform regularly at Christmas parties, birthday parties, day care centres, corporate events, shopping centres, fairs, christenings, product launches and just about any other event under the sun. Searching for a fun fairy party game idea to play whilst waiting for your entertainer to arrive? Your party entertainer gathers the fairies and makes them form a circle. The children pass around a treasure whilst a good song plays in the background. This treasure is wrapped in several layers of special wrapping paper. When the music stops, the child holding the treasure unwraps one wrapping paper. The entertainer plays the music, and the treasure gets passed around again. This continues until one of the fairies unwraps the last layer of wrapping paper, thus revealing the treasure. The kids share the treasure with each other – everyone is a winner in this Adelaide birthday party game! 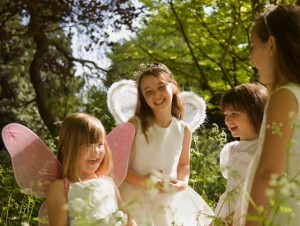 We have made a list of easy fairy party preparations for your child’s fairy party. Let us know which fairy party idea you were able to do at your event! Think nature and enchantment whilst deciding on an invitation design. Be creative! Create a fairy wand invitation. You can do this by opening Microsoft Word in your computer and inserting a star shape on the document. Type all the party details and print it on cardboard cardstock paper. Tape or hot glue the star on a chopstick and your all set! You can also add ribbons to the wand to give it a more whimsical look. Cut out a shape of a butterfly, then write the party details on it. Decorate it with glitters and sequins. Print your invitation on kraft paper. Roll it into a scroll. Cut out a shape of a leaf from green cardstock paper or use a leaf-shaped punch. Insert the twine in the leaf before tying the twine around the invitation to secure it. Add earth tones to pastels to keep the decorations girly whilst incorporating the fairy party theme. Cut out butterfly shapes from different pastel colored cardstock paper. Fold them in half – this will give the butterflies a line at the middle that gives dimension to it. Use double sided tape to stick it on to the walls. Wrap large balloons with pastel tulle fabric, then secure it with a flower hair scrunchie. Not feeling the tulle design? You can simply use a flower scrunchie to decorate the part where the balloon and balloon stick meet. Hanging party buntings can instantly brighten up the party venue. Food for fairy parties is really fun to prepare! All you need is a little imagination. Dip stick pretzels in white chocolate, then top it with candy sprinkles. Let dry. Label it as Fairy Wands. Insert half of a large marshmallow on a stick so it’s at the top part of the stick. Cut out a leaf shape from crepe paper and glue it on the stick, just below the marshmallow. You can also dip this in chocolate and add candy sprinkles. The children will enjoy these flower-themed fairy treats! It’s good to plan fairy party games and activities beforehand. Don’t give the children a chance to feel bored. It will be a challenge to change their mood once they become restless. Set up a fairy wand station. Give each child an undecorated wand. It can be as simple as a cut out star taped to a chopstick. Provide glue, sequins, beads, and even glitter and have them personalize their wand. This can also double as a party favor. Relays are always fun! Play Fairy Pixie Dust Relay: Split the kids into 2 teams. Each team gets one spoon and a bowl of glitter (fairy pixie dust). The first player gets a spoonful of glitter and walks as fast as he/she can to the turnaround point and back to his/her team. The spoon is passed on to the next player and so on. The first team who finishes the relay is declared the winner. The best way to make sure that the children have a jolly good time is to hire a fairy entertainer. Yabadoo offers great entertainment at reasonable prices – you’ll get more than your money’s worth! Let’s talk today about how we can make your kid’s birthday party entertainment special. Show your appreciation to your guests by giving them something to remember your child’s fairy birthday party by. Pinwheels are a cute party favor idea! Put sequins, glitter, or a mix of both in a tiny bottle. Print “Pixie Dust” tags on sticker paper and label the bottles. Mega fairy bubble wants will surely be something that the children will love to receive. Use kraft paper and twine as tags so you can still incorporate your fairy theme.